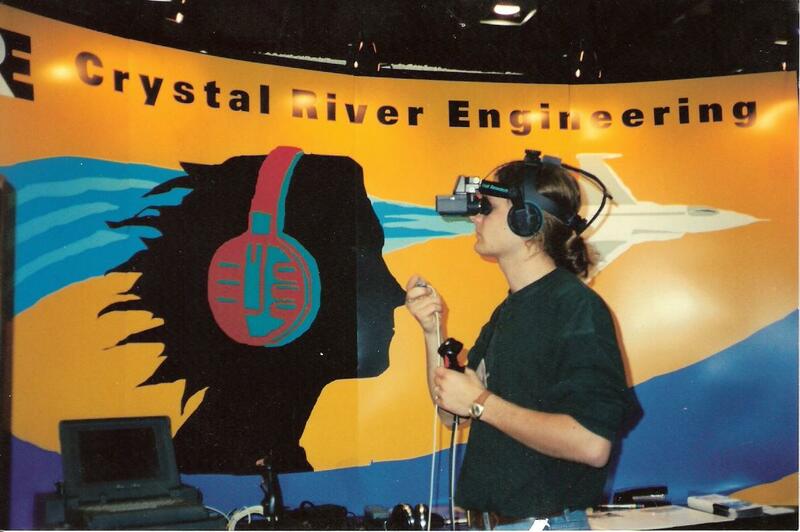 That’s me setting up our Virtual Reality demo at a WinHEC conference (I’m guessing 1994). I remember the show because later that day Bill Gates came by and I gave him the demo 🙂 The setup was designed to show off our 3D audio software (us being Crystal River Engineering, the 3 person startup I joined out of college as a software engineer). We used to have long lines of people eager to put on the headphones and head mounted display to experience flying through a virtual world of simple polygonal objects that barely looked like, but sounded exactly like helicopters and airplanes buzzing around your head. Everything was rendered in real-time and your head and hands were tracked using sensors, so you could hear a plane behind you, turn around to face it, blow it up and then fly through the explosion. I think I have a CD-ROM with recorded 3D audio demos somewhere… maybe I’ll try to dig it up one of these days. Hey – I remember that day! I was running people through demos when Bill and his entourage/handlers came up. I stammered out a few syllables, then quickly handed the reigns over to you! Our little VR demo was awesome. It always drew a crowd.